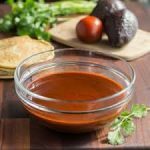 Use this economical enchilada sauce to prepare enchiladas or any recipe calling for enchilada sauce. You can adjust the seasonings to your taste. Heat oil in large 2-quart saucepan; stir in flour, stirring until well blended and smooth, add chili powder; cook for 1 minute.